The Euphoria 110 Mono shower set is a practical set which can be easily installed in your shower. Complete with hand shower Mono, with the Rain spray for the feeling of an invigorating rain shower, a 600 mm shower rail and shower hose of 1750 mm. The set also includes the handy GROHE EasyReach™ soap tray, so your shampoo and shower gel is always within reach. TwistFree is also very practical, it makes sure which the shower hose rotates with every move you make and which it never gets tangled up. 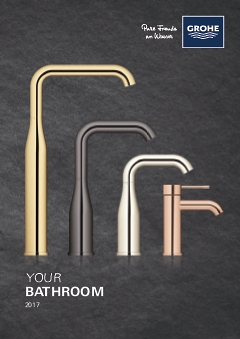 The set is made in GROHE StarLight chrome for an eye-catching shine in your bathroom. The Inner WaterGuide ensures that the shower head stays cool enough to comfortably keep it in your hand, also ensuring a longer life of the chrome coating. SpeedClean makes sure that the shower requires little maintenance. Wiping the spray nozzles with your fingers is enough to sweep any limescale away.